Properties in México City average 4.3 out of 5 stars. Property 7: Best located Suite!! Property 9: Soak up a lovely stay!!!! Amazing full house very spacious and well located within Nuevo Polanco. Property 17: Amazing full house very spacious and well located within Nuevo Polanco. Property 19: Casita Narvarte! Traditional Mexican charm amidst Urban Mexico City life. Property 26: House in Lindavista with Excellent Location! 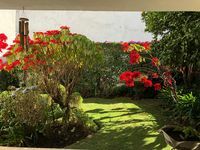 Property 27: House in Lindavista with Excellent Location! 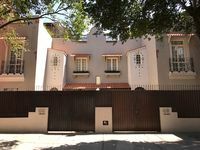 Property 41: Amazing in Polanco ! Beautiful House In The Heart Of The Most Trendy Area Of The City. Property 43: Beautiful House In The Heart Of The Most Trendy Area Of The City. Beautiful & Spacious. Large Balcony. Top Location. Property 50: Beautiful & Spacious. Large Balcony. Top Location. I traveled with 2 couples plus myself and my senior mom. We loved the location of the property as well as the style and furnishings on the first and second floor. To be honest, one of the couple left and refused to stay in the article room. It had a very narrow and slightly wobbly staircase upon entry, the walls were not completely finished, there were ants crawling over the bed, and the shower in the attic has a door (of frosted glass) that opens directly to the terrace. The description of the property does say the third room is in the attic but lacks clear photos of the conditions. This surprise caused quite a ripple in the group vacation. Otherwise the place was great and the host was accommodating when I asked to check in early and out late. Our experience was positive for many reason, we were greeted on time shortly after arrival in a courteous and professional manner. The home is just marvelous and we look forward to additional stays at this ideal location. Plenty of room to spread your wings for privacy and elect together time with wifi, television, books, games, full kitchen, well stocked kitchen with water bottles, washer and dryer in open air patio, the garden is beautiful as shown on the picture, car port, safe, very good location, quiet equals good rest on nice beds. All positives, very happy and will be back! Thank you for having us stay at your place and treating us like family.